We all secretly adore comfort food, despite all the calories and the slight “guilt factor”. Well, if you are willing to admit it, go to Poland and taste some of the world’s most delicious comfort food. You’ve got lots of eggs, cream, potatoes, cereals, meat including beef, pork and chicken, delicious soups, goulash, dumplings and to top it all off with a twist, add some pickled gherkins, sauerkraut, beetroot and yummy spices like marjoram, dill, caraway, parsley and pepper. Yumee! Poland has a long tradition of family meals and dinner parties with friends. Often, the chef would be preparing food for several days in the run-up to a shared meal. When eating together, people eat and talk and eat and talk and eat and talk. Though possessing it very own, unique dishes, Polish cuisine is in some way similar to Austrian and German food, only more delicious. If also has Italian and Russian influences. Traditionally, Polish People eat their main meal at around two o’clock in the afternoon. Polskie Naleśniki – Depending on your toppings, you can have Polish pancakes for breakfast, lunch or dinner. The pancakes are very thin and combine well with a wide variety of toppings. For breakfast fill the pancakes with quark, jam or sugar. For lunch, add some pickled vegetables or light meat and for dinner, fill them with hearty vegetables or cheese. Scrumptious! Gołąbki – Perhaps comparable to the Greek stuffed vine leaves, this speciality combines simmered or fat-fried cabbage leaves with succulent fillings. You may fill them with rice, mince pork, onion or mushroom. They are usually quite large and filling and make for a perfect hot meal. Śledź w oleju – Two Ways – With all the talk of the health benefits of oily fish, you ought to give this dish a try. You eat the herring with either sour cream and pickled onions or else with oil and garlic. Out of this world! Bigos – The Polish Hearty Stew: If you like stew, you will adore Bigos. The variety of ingredients is eclectic and the choice unbelievable. You can have a stew with sauerkraut, prunes, onions, spices and add meats like sausage which is quite a step up from blander, traditional stews. 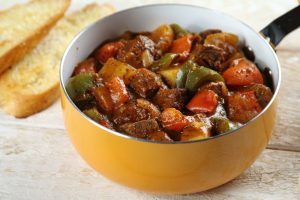 Gulasz – In this goulash you will find meat, potatoes, vegetables like in other countries. The Polish have however given this dish new flavours by adding peppers and fried onions. Łazanki z kapustą i grzybami – For the perfect weekday dinner, why not cook tagliatelle with pork, cabbage, and onions. Pierogi – Dumplings are very popular in German and Austria dumplings. You can fill your dumplings with meat, onion and mushrooms. Alternatively, you may fill them with berries, buckwheat, cottage cheese, potatoes and fried onions. You certainly won’t be short of comfort food in Poland. If you are watching your weight, try a little anyway. Polish cuisine is quite similar to German cooking, just a little more interesting. I would of course be biased because of my beloved grandmother, but there is no doubt all the above dishes are perfect for any occasion. Watch this space for a step-by-step guide to cooking these delicious dinners. Remember, the fresher the ingredients, the better your meals will taste. 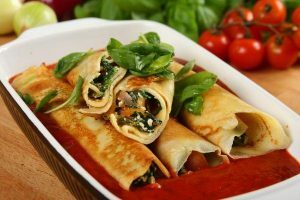 Food is very important in Polish culture and if you happen to be there, immerse yourself a little in Polish cuisine and culture – and fall in love with both.